Some Bonds Are Meant to Be Shattered. Darien Lauchlin betrayed his allegiance to the Rhen when he sold his soul to the God of Chaos. Now the unthinkable has occurred: war between Malikar and the Rhen looms on the horizon. As Darien prepares to lead an invasion against his former homeland, he struggles to unite a diverse people who still view him as the enemy. Darien is forced to abandon his former loyalties and confront the tragedies of his past. With the help of Azár, he embarks on a series of trials that will forge him into the Battlemage his people desperately need him to be. But will the price of becoming a weapon be the last of his humanity? In Malikar, the Darklands, their culture relies on magic for survival. The global magic field is in danger of collapsing, and if it does, their way of life cannot be sustained. They decide to evacuate to a region where they might have hope of survival, but the only path out goes through The Rhen, a nation who has long seen them as enemies. Darien will do anything to protect and unite the people he has vowed to save. As the imminent conflict looms, he meets with the leaders of The Rhen to discuss a possible compromise. Will his old friends, now on the opposite side of the field, understand his reasons and negotiate? Can they find an agreement both sides will honor? In a separate storyline, we follow Quin and Naia as they search for a way to repair the weakness in the magic field and avert the impending crisis of its collapse. If they can succeed, perhaps war can be prevented. Darien once again has impossible choices to make. The way the characters align, there are hard choices on both sides of the war, and more of them begin to experience something Darien is well-versed in—doing horrible things for good reasons. Both sides commit atrocities for the sake of their own righteousness. Spencer keeps the stakes high and the tension tight, bringing the reader through new love stories, new parts of the world, giving the characters more reasons to fight, and more reasons to die. I went immediately into Darkfall, the series conclusion, and I can't wait to see how all this ends. 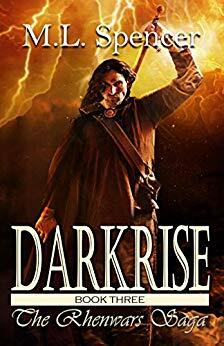 You can find Darkrise here on Amazon or here on Goodreads.